Wouldn’t it be fun to hang out with your favorite Disney characters in real life? Well, now on Instagram, one artist can. Instagram and Disney go hand in hand. Artists imagine what a Disney character’s Instagram pictures would look like. Fashion designers build incredible Disney-inspired dresses. 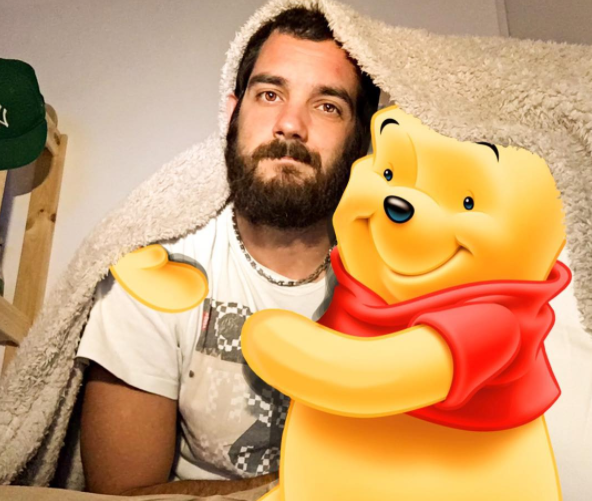 Now one adorable bearded artist has found a way to literally hang out with his favorite Disney characters. He’s an Italian illustrator and photographer, known on Instagram @kemslife86. He combines his masterful illustration (and Photoshop) abilities into totally sweet photos. And his Disney character hangouts are a literal dream come true. 1He and Winnie the Pooh get all cute and snuggly under a blanket. 2He takes a magical walk in the park with Mickey’s cute pup Pluto. 3He gets a little romantic with Tramp from Lady and the Tramp. 4He rocks some fabulous animal print, Cruella de Vil style. 5He spots a sly little Cheshire Cat smiling at him. 6He adopts a new pet Stitch, who may cause a bit of havoc. 7And he befriends another alien, E.T., who takes him on quite a bike ride. 8And things get a little dicey when he gets in the middle of the Coyote and Roadrunner spat. We can’t wait to see who he hangs out with next!